I have read and read all I could but a quick back story. picked up a blown headgasket 94 z28 and stripped it down and put it all back together to get it firing in about 14 hrs in car and it sucked. Never owned one till now and I do YouTube rebuilds and this seemed awesome https://www.youtube.com/channel/UCIA...tL_3XwUksdz-sQ second video up soon but it actually running was on my Instagram @8526productions. problem I am having is I believe I have a 95 throttle body from replacement I bought while building other motor for a later time and the stupid steam pipe has me baffled. I honestly don’t know if it should go into radiator (where it is) or pass side throttle body? Reason I am asking is because it ran maybe a minute or two and literally steam cleaned the motor from the backside near the banjo bolts. Obviously I’m going to recheck the seals and tightness but had me worried it’s routed wrong. If ANYONE can break this down Barney style for me with a picture of hose placement on there car it would be awesome. It’s all stock and I’m just an idiot and have looked at all pictures and diagrams but just want to get it all hooked up right as this is literally the only thing keeping it from small body work and paint. Again sorry it’s long winded but coming from building semis to Camaros it’s honestly a different ball game lol but so far so good I just need to see hose routing for front of tb and intake. A 1994 routed the coolant from the steam pipe directly to the connection on the radiator. Make sure you have the correct (lower) connection on the radiator. Some people manage to erroneously switch the overflow and steam pipe connections. 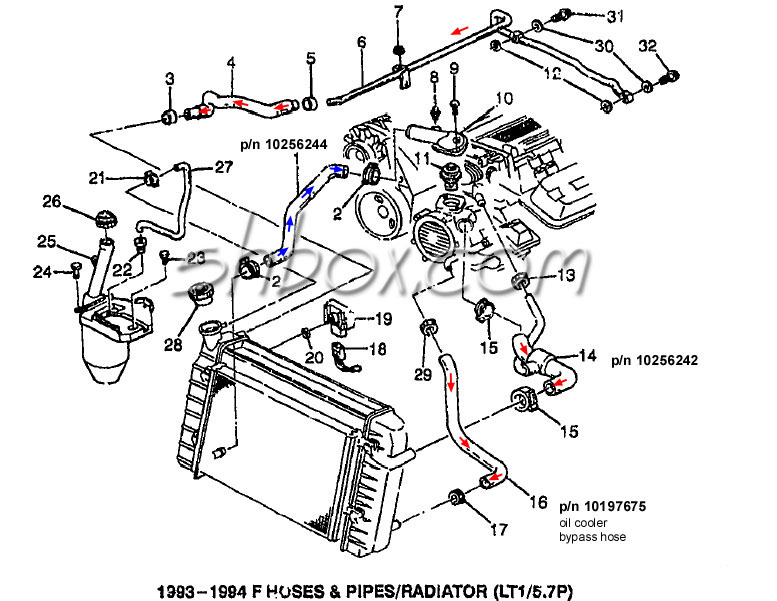 In 1995-1997, the steam pipe coolant flows to the throttle body, and then to the radiator connection. 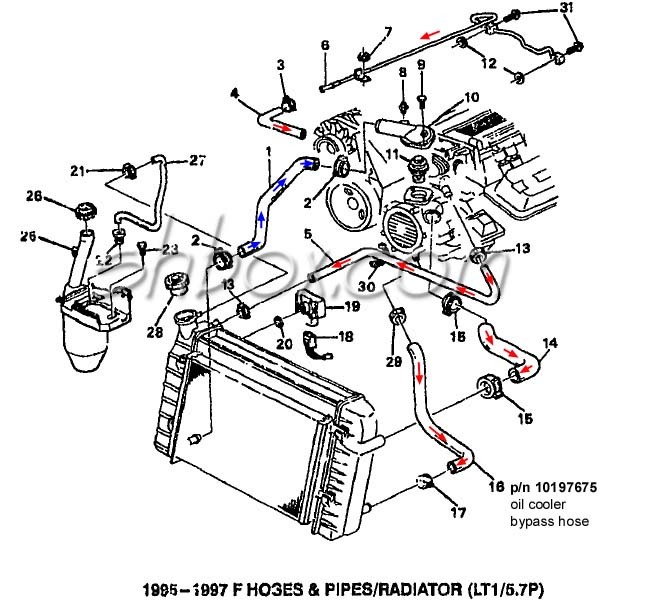 If you are using 94 hoses, do the connection per 1994 diagram. In that diagram, the elbow #4 connects to the passenger side coolant pipe on the bottom of the throttle body. But the throttle body is the same on all years 1994-1997. In both cases, the coolant flow to the throttle body can be deleted, by connecting hoses together. This will net you a dyno proven 6HP, Only downside - if you live north of the Arctic Circle, you may encounter throttle body icing (j/k), because that's why GM routed the coolant through the TB. Last edited by Injuneer; 04-05-2019 at 04:51 PM. Electronics gurus inside please...I need a 12V+ delay timer. Cam install. Is it that hard for 1st timer ?